More than 70 persons are reported dead in a fatal crash on the Kintampo-Tamale highway. 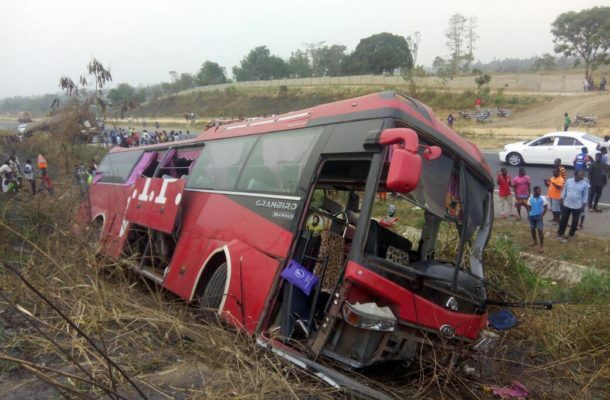 The accident which involves two buses occurred Friday dawn at Amoma Nkwanta near Kintampo in the Kintampo North Municipality of the Bono East Region, along the main Kintampo-Tamale Highway. It has been confirmed that a VVIP Kia bus with registration number GT 3915- 17 from Garu in the Upper East Region heading towards Kumasi collided with a Grandbird bus with registration number GT 5694-18 from Accra which was heading towards Bolgantaga also in the Upper East Region. All passengers on board the bus which was en route from Garu and bound for Kumasi have been burnt beyond recognition when the vehicle went up in flames soon after the crash. As at the time of filing this report, the exact number of dead passengers had not been established, but we can report that only a handful survived the carnage. Kintampo Municipal Fire Commander (DO3) Mr Ankomah Twene who confirmed the unfortunate incident, said it took his men close to 30 minutes to douse the fire on the other bus before they could cut and take out the dead bodies.